Recently I paid a farewell visit to the house where I grew up. My father is in the midst of moving out of the place. I took a few pictures of things I wanted to remember. 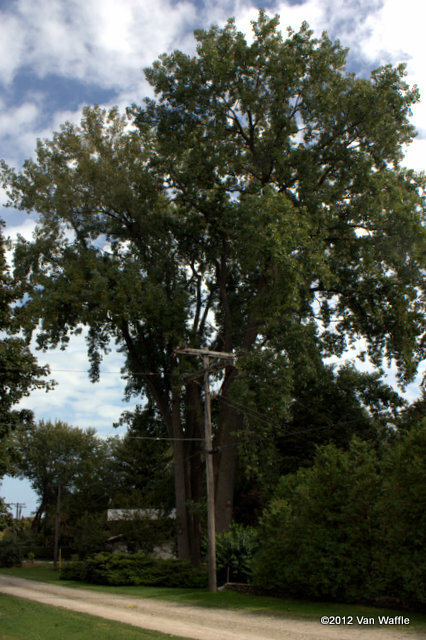 These giant cottonwood poplars, Populus dentoides, dominate the landscape of my memory. The beach road where I grew up is called Poplar Bluff. It overlooks Lake Erie. Many venerable silver poplars, P. alba, grew along the crest of the bluff, and I suppose the place was originally named for them. Sadly, many were dragged into the lake by severe erosion during the 1970s, although the ones on our own property were spared. At one time a gigantic dead cottonwood stood at the foot of the bluff. Stripped of bark, it looked like montrous driftwood. Red-headed woodpeckers, an endangered species in Canada, nested in it. Once we saw a bald eagle perched in its branches, looking for fish. This was at a time when these birds were still extremely rare in Ontario. However, no tree grew as large in my consciousness as the cottonwoods beside our house. I guess they must have been smaller than this 45 years ago, but even then they towered above all the other trees. For scale, compare the telephone pole and our two-storey house and mature silver maple in the background. It is a stand of five or six trees. It seems strange I do not know how many, but in my mind they were a unit. Of the many birds that visited them, our favourites were the Baltimore orioles that always built a new hanging nest every year and fed off the nearby mulberries. We did not expect them to live so long. My family moved from the city when I was small. In our minds at first poplars were not quite weed trees, but almost. We planted a horse-chestnut to take their place eventually. It has grown to considerable height and yet cowers in their shadow. It turns out P. dentoides is one of the largest North American hardwood trees, up to 40 m tall, and I guess these specimens are at least 30. They can live 100 years or much more given ideal conditions. I cannot imagine a happier place to grow for decades than Poplar Bluff, so they will probably outlive me. In my mind’s eye they will always stand in a Hobbema landscape. I LOVE cottonwoods, which also grow here in Arizona. I didn’t know they are poplars. They are so beautiful, and their leaves in the spring define the color green for me. You probably have P. fremontii, a closely related species in the same genus. I love the cotton, too. Some years it almost cover the grass when it fell.